The post All About the Fila Brasileiro (a.k.a. the Brazilian Mastiff) by Allan Reznik appeared first on Dogster. Copying over entire articles infringes on copyright laws. You may not be aware of it, but all of these articles were assigned, contracted and paid for, so they aren’t considered public domain. However, we appreciate that you like the article and would love it if you continued sharing just the first paragraph of an article, then linking out to the rest of the piece on Dogster.com. There are a few large working breeds whose fearless guardian traits are so pronounced that canine experts would never recommend them for the average home. Two such dogs are the Fila Brasileiro (Brazilian Mastiff) and the Perro de Presa Canario (Canary Island Dog of Prey). In the right, experienced hands, and given a job to do, they can serve their owners well, but their strength, dominant temperament and potential for aggression make them completely inappropriate for most situations. Let’s learn more about the Fila Brasileiro (a.k.a. the Brazilian Mastiff) here. The Fila Brasileiro. Photography ©Artush | Getty Images. 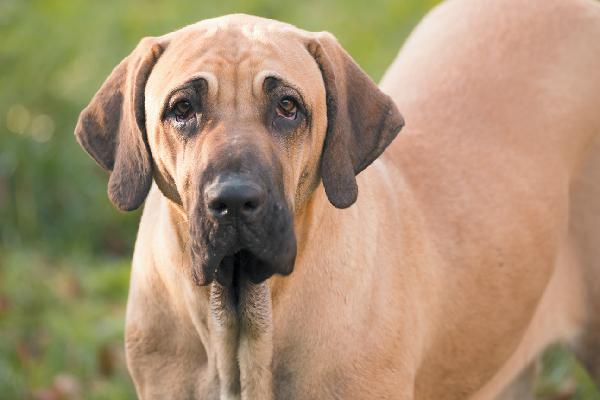 Given the breed’s unusual appearance and loose skin, it is believed that the Fila Brasileiro was developed by crossing the English Mastiff, the Bloodhound and the old Bulldogs of the 15th century. Filas were bred and raised on the large Brazilian plantations and farms. They were taught to chase down jaguars, cattle and other animals. The dogs would grab the animals by the neck and hold them until the farmer arrived. This instinct can be observed among puppies during play. The word “filar” in Portuguese means to “hold, arrest, grab.” The breed is known to be instinctively protective, extremely wary of strangers and incredibly agile when protecting its master. The breed’s historic dedication gave rise to the Brazilian saying, “As faithful as a Fila.” The Fila Brasileiro temperament is what characterizes the dog. The Portuguese word used to describe Fila temperament is “ojeriza,” which means dislike and distrust. Even with extensive socialization, the breed is naturally protective. This breed is not the best choice for anyone who has frequent visitors to their home. In countries where the Fila Brasileiro is exhibited in dog shows, it is expected that the dogs will have been exposed to strangers, yet the Fila Brasileiro is a “hands-off” breed, and judges assess the Fila Brasileiro entry by means of a visual examination only. Thumbnail: Photography © fotocelia | Getty Images.